← If you Believe you will see the Glory of God! 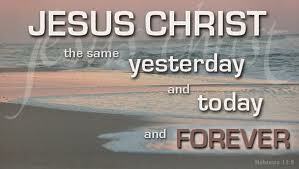 Jesus Christ is the same yesterday, and to day, and forever. As our 6-person team prepares for our northern mission trip/adventure – 4 of us going for the first time and feeling some trepidation – it’s wonderful to remember that we are children of almighty God. He is perfect, always was, always will be. By the power of His Spirit in us, He can accomplish amazing things. I look forward to sharing them upon our return. Jesus is in control so it will be great! We praise the Lord, sing Hallelujah and say Amen (so be it)! We must keep our eyes on Christ, our ultimate leader. Christ has been and will be the same forever, in a changing world we can trust our unchanging Lord. I know God is God, and He always will be God.’ We often try to dis-engage ourselves from the spiritual way of thinking – seriously! We tend to think the way man thinks; after all, we are still in the flesh. The Spirit within us keeps prodding our minds, wanting us to relinquish our whole being to the Lord. But, we keep overriding the Holy Spirit and go on our merry way. And, we get in trouble! This entry was posted in Living by faith and tagged jesus, who we are in Christ. Bookmark the permalink.